Discover the freshness and the quality of the products of our region. Sophisticated tastings and musical animation in orchards; all the ingredients are combined for a successful adventure! Rougemont, it is much more than apples. Let be guided by your senses and discover the other treasures of Rougemont by browsing the agrotouristique map. Refreshing ciders and wines to be discovered, plums and juicy pears, comforting tarts and jams for sweetened beaks, fresh vegetables and flavourful, terrible pumpkins and original gourds, local products and home-made treasures. See the map for the tastings in Rougemont (Quebec). About thirty businesses from Rougemont will offer a variety of services and / or products such as U-pick, guided tours, tastings and dining! Check out the services offered by each producer. Picnic area. Groups welcome. Pets allowed. Boutique. Playground. Cart rides. Product tastings. Guided tours ($). Farmhouse. Hiking trails. 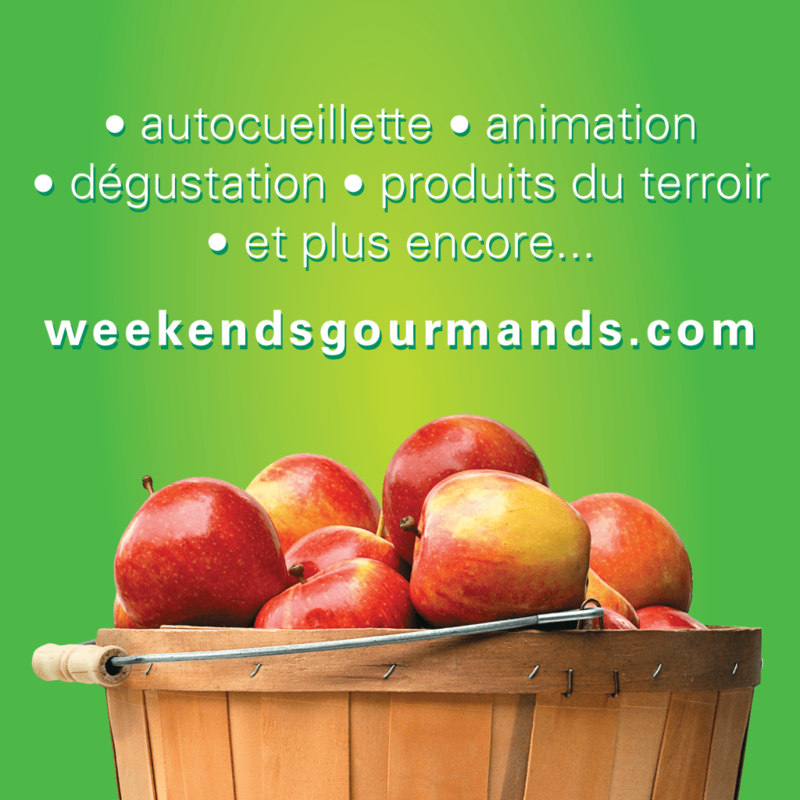 Every weekend from September 8th to October 14th, 2018.
https://tourismecoeurmonteregie.ca/wp-content/uploads/2016/05/weg-2018-2-1024x1024.png Les Week-ends gourmands de Rougemont Discover the freshness and the quality of the products of our region. Sophisticated tastings and musical animation in orchards; all the ingredients are combined for a successful adventure! Rougemont, it is much more than apples. Let be guided by your senses and discover the other treasures of Rougemont by browsing the agrotouristique map. Refreshing ciders and wines to be discovered, plums and juicy pears, comforting tarts and jams for sweetened beaks, fresh vegetables and flavourful, terrible pumpkins and original gourds, local products and home-made treasures.